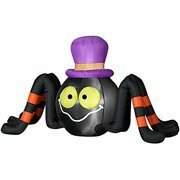 This Outdoor 4' Long Airblown Spider with Top Hat will make an ideal addition to your Halloween decor. It's sure to put you and your neighbors in the Halloween spirit. This inflatable spider lights up and self-inflate in seconds. It comes with everything you need to display it on your front lawn, including stakes and tethers. It is easy to set up and also quickly deflates for easy storage in the off-season. Delight and spook trick-or-treaters and passersby with this fun Halloween decoration.